Domino is a Marvel hero primarily known for her role on the mutant team X-Force. Domino will appear in the film Deadpool 2 and be played by actress Zazie Beetz. How is Apocalypse defeated? Killed? Domino or Neena Thurman was part of an experiment to build weaponized mutants called Project Armageddon. Project Armageddon used the DNA of a precognitive mutant named Beatrice. Domino was one of only two survivors of the brtual experiments. She was eventually stolen away by a cult that worshipped Beatrice called the Amrajesuits. The Armajesuits hid Domino with a Chicago Priest who raised her. Thurman found out that she had a power to alter probability when she acted upon something. This power gave her greatly enhanced reflexes and let her to extraordinary things like dodge bullets. She used power to make herself into a top level covert agent and mercenary. On a mission to guard a strategists named Milo Thurman she fell in love with him. Milo and Neena married in secret. Milo bestowed upon Neena a nickname that would stick the rest of her life, Domino. After being attacked by AIM the pair is seperated. Thurman is told that Domino is dead and he is forced to even go into deeper cover. Domino joins the brutal mercenary group known as Six Pack where she befriends Cable. Cable recruits her into his new group X-Force. However, unbeknownst to Cable this Domino is the impostor Copycat and the real Domino is being held captive by Tolliver. She eventually frees herself and kills her impostor. She then immediately joins X-Force. Domino becomes a long time member of X-Force. She has led the team on several occasions after Cable left. Domino has a subconscious telepathic power that works like good luck or bad luck for opponents. Her power requires her to take actions in order for it act. She can not stand still in a fight but must move and dodge. However, if she is taking action she can do extraordinary things like dodge bullets or summon a lightning storm that blast opponents. Domino will appear in Deadpool 2 and be played by actress Zazie Beetz. 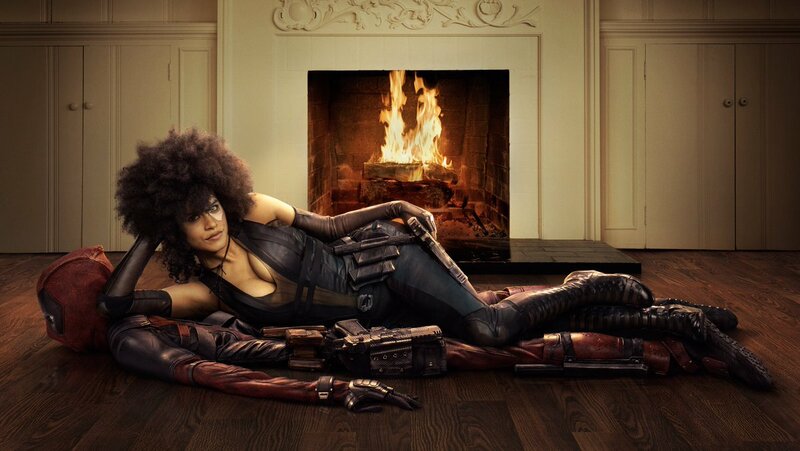 Ryan Reynolds tweeted out a picture of what Domino will look like in Deadpool 2. Zazie Beetz followed Reynolds by releasing this photo of the character on her Instagram. #Domino, #Marvel, #Toylab, #WhoIs for the day, a character who is lighting up #comics and the big screen!